pak design were approached by Broadway Radiology to create their new premises, the project brief being ‘to create a landmark building for Palmerston North’. Heading back to the office from a design meeting with the client, a leaf was blown into their path, giving the inspiration for the main street entry – the ‘leaf’ being the muse to the natural theme of the building. From there the flow of the structure grew organically. Branching out from the main atrium, to the left of the building is the high tech area that houses the latest state of the art medical imagery equipment, the other side housing the Women’s Health area. Both areas required meticulous planning to ensure the most efficient use of space and work flow. To the rear is Broadway Radiology’s administration area and staff facilities. The large staffroom enables the team to feel at home, and doubling as a conference area with a movable wall into the boardroom. Both spaces open on to a sheltered courtyard allowing a natural flow to the outside. Consideration was also given to patients who are attending the centre for diagnosis or treatment – it was paramount that their experience made them feel relaxed as comfortable as possible. Energy efficiency has been carefully considered with natural light adding to the comfort of patients and staff. Like the new spring growth, the concept drew inspiration from nature and grew organically allowing a strong sense of symmetry around the focal point of the main leaf entry. The plywood veneer panelling above the entrance imitates the veins of a leaf while curving into the position. The main leaf greets you from the road frontage with herringbone paving leading you up to the entry doors. The leaf continues inside until you are met by the open and spacious reception with views out to the courtyard beyond. The precast concrete is imprinted with a natural grass pattern, which has been continued into the glass façade, providing filtered light from the high level windows into the passageways. LED light have been installed to enable the client to display various colours commemorating events such as Breast Cancer Awareness Week. Cedar weatherboards add texture and warmth. Extensive planting and landscaping make the exterior look inviting from the street. 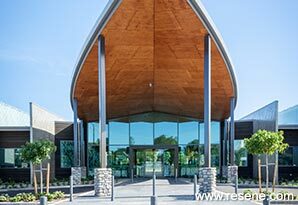 The clients wanted to ensure that the local Manawatu community and surrounding landscape was the focus for the centre. Resene Black White was selected for its natural background to carry the textures and hues of colour that MMiD wanted to inject throughout the entire project. One of the highlights of the centre is the architectural atrium which expands to encompass the entrance from outside. MMiD wanted to ensure the wood, that was the main feature of the leaf shape, was highlighted. Resene Bokara Grey was used on the surrounding ceiling areas and the wood was brought to life using a half and half blend of Resene Colorwood Walnut and Resene Colorwood Reducing Base and Resene Aquaclear satin. The concept slab walls were sealed and kept plain ensuring the art pieces have fabulous neutral background. Soft hues of colour were painted to highlight ceilings and carry the wallpapers selected in these areas. Resene Cest La Vie, Resene Coconut Cream, Resene Emerge and Resene Secrets gave warmth to areas that can otherwise seem soulless and cold. Natural textures were always the main focus of the overall scheme and heavily brought to life through the furniture, wall and floor coverings. Resene Moxie was used in the staff areas to bring in local rugby team colours for fun and patriotism. The Andrew Steel artworks took accent colours from the surrounding furniture. Testpots of Resene Good Life and Resene Native were used to add accents to the calligraphic style of street art in the patient waiting areas. The exterior of the building is predominantly concrete and glass. Using Resene Woodsman Banjul stain on the cedar weatherboards helps to highlight the patterned tilt concrete panels so that they remain the main focus of the exterior, while Resene Lumbersider in Resene Half Friar Grey balances out the other hues and textures. Exterior precast is finished in clear Resene Uracryl, which provides protection to the concrete and against graffiti. The building feels cohesive with the land and the surrounding areas. Broadway’s main focus was to ensure that the community felt connected with the centre as they were building the facility for the people. MMiD wanted to bring warmth, fun and life to a place that can sometimes be an overwhelming experience, giving staff a home away from home and embracing those visiting with a warm homely approach. Every area of the project had to feel unique to its purpose but cohesive in the overall look and feel of the centre.